BB: Can you tell us a little more about the mission of 31 Bits? 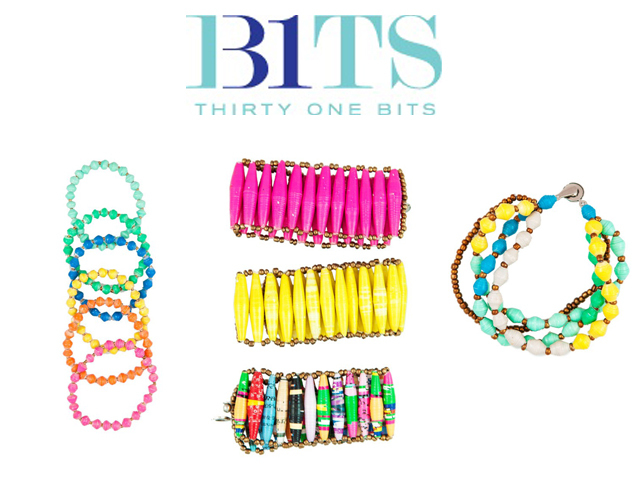 J: 31 Bits is a socially minded business using fashion and design to empower women to rise above poverty. We work with women in Northern Uganda who are making jewelry out of recycled paper. By selling the jewelry here, they not only provide a sustainable monthly income for the women, but also education and development programs that prepare the women for future careers. BB: What is the process of buying and selling the jewelry, and how does it specifically help the women in the 31 Bits program? J: We purchase jewelry from each woman on a monthly basis, providing them with an immediate, consistent, and fair income. Each piece of jewelry is handmade using 100% recycled paper and other local materials. By selling these products in the international market, we are able to generate a profit that is used to continue purchasing jewelry for our beneficiaries, as well provide them with numerous development programs, equipping them to develop a career and attain social equity on a local level. We are committed to working with each woman until she has graduated from our program and attained a sustainable means of income within her own community. BB: What kind of education do the women receive in your program? : We provide English lessons for each of our beneficiaries. Most of the women we work with have never had the opportunity to learn English because they could not afford to go to school. We offer bi-weekly lessons taught by one of our program managers, Gladies. Although the English lessons are optional, almost every woman attends because of their strong desire to learn. After starting the program, we realized that within a few months, women were already having conversations in English! Finance Training: We partnered with local University professors and our board members to develop a finance-training program for our beneficiaries. After going through the program, each of our beneficiaries will have an understanding of poverty and the mindset behind living in poverty, as well as how to save money, manage an account, budget for their families’ needs, and how to take out or pay back a loan. Every woman in our program has received a personal bank account. Community Groups: We’ve taken a holistic approach to development, meaning we think it is important to care for our women beyond their economic and educational needs. We also want to make sure they are being cared for mentally and emotionally. We connected with a local organization to assist in training six of our beneficiaries in counseling and leadership. The rest of our beneficiaries have been divided into Community Groups that meet with a leader on a weekly basis. These weekly gatherings provide a unique opportunity for beneficiaries to seek counsel and prayer from their leader. Community groups also provide an opportunity to check up on each of the beneficiaries’ work and finances. AIDS and Health Education: Approximately one-third of our beneficiaries are HIV positive. By providing AIDS and Health education, our beneficiaries are able to receive counseling and guidance on how to take their medicine and stay healthy. This program is led by one of our project managers, Gladies. Gladies is attending a training in AIDS counseling, enabling her to teach other’s about physical well-being related to AIDS. Gladies also addresses mental health issues by being available to women for one-on-one counseling. Many of our women have undergone abuse and traumatizing events that they are addressing for the first time in their lives. : As our beneficiaries learn to save money, they are also learning to set goals for the future. Within three to five years from their entrance into the program, we want each beneficiary to graduate with a way of earning a sustainable living beyond 31 Bits; either by starting a business or joining an existing business. To prepare for this, each woman will attend a vocational training program. Not only will this program teach each woman the foundations of starting and operating a business, but it will also help women identify their talents and skills and how individual skills can be maximized in the local market. We will guide beneficiaries in the development of their businesses by providing individual business mentors. 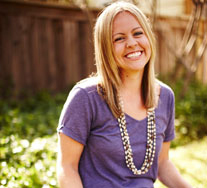 BB: We’re absolutely smitten with all of the 31 Bits jewelry, especially the new wedding line. Can you tell us what inspired the wedding collection? J: The theme of The Wedding Collection is “First Comes Love...” Your relationship didn’t start with a wedding, just like 31 Bits didn’t start with a business plan. It simply started with love. When the girls of 31 Bits met women in Uganda, heard their stories, saw their talents, and met their families, they knew there was an opportunity to do something much greater. It began in 2008, selling jewelry made by six Ugandan women, and have since then grown to over 100 women! With every piece of jewelry sold, women are being empowered. The Wedding Collection gives brides the opportunity to use their love story to share another story. As these exquisite pieces play a part in your big day, they will also play a part in creating new futures for our women in Uganda. Contact your local Bella Bridesmaid to ask about the 31 Bits collection!